This work is a slightly modified version of Dov Grobgeld’s excellent tutorial. It has been updated to Gimp-Perl 2.3 and GIMP 2.8. One of the wonderful features of GIMP is that it all its functionality may be accessed through scripting. Available scripting environments include Scheme through Script-Fu and Python. Perl has CPAN, giving access to vast numbers of modules to get things done. Now, GIMP may also be scripted in Perl. This tutorial will describe how to write such plug-ins and scripts for Gimp. As there are several excellent tutorial texts describing the perl language, this tutorial will assume a working knowledge of Perl, and will instead concentrate on the use of GIMP together with the perl modules Gimp and Gimp::Fu. Perl version 5.14 or later. Perl and all its associated modules are available in source form from the Comprehensive Perl Archive network, CPAN. Most scripts make use of the simplified interface Gimp::Fu provided with the Gimp module. Gimp::Fu provides a framework for entering parameters to the script in a dialog-box interface, just like Script-Fu, but also allows running of the script in batch mode from the command line. This tutorial will go into detailed descriptions of the construction of a Gimp::Fu script, but before we do this, here is the general framework of such a script. the POD documentation below the __END__ line. Before going into the details of the Gimp::Fu script, we will describe how to access the functionality of GIMP. All functions known to GIMP are available through the procedural database (PDB). All the PDB functions may be called from perl, as will be seen below. These PDB functions are either internal to GIMP, or have been made available through a plug-in or a script extension, but as far as the caller is concerned there is no difference. As we will see below, when a perl function is registered through the podregister function, it will appear in the PDB as well. Applies a gaussian blur to the drawable, with specified radius of affect. The standard deviation of the normal distribution used to modify pixel values is calculated based on the supplied radius. Horizontal and vertical blurring can be independently invoked by specifying only one to run. The IIR gaussian blurring works best for large radius values and for images which are not computer-generated. Note that Perl is using underline characters where the DB browser uses hyphens! The PDB entry above shows that plug-in-gauss-iir is called with various parameters, of various types. These will be explained below. You will also see that the first parameter, run-mode, was omitted. This is a feature of Gimp-Perl, which will automatically supply that parameter if you leave it off. This will make your code a lot tidier-looking. Gimp::Fu is Perl’s answer to Script-Fu. It provides a simplified method for accepting parameters for a script through a Gtk2 interface, just like script-fu, but as we shall see below, it has some additional bells and whistles. The name of the function. It comes from the first part of the NAME section, before the dash. Tells GIMP the name by which the function will be known in the PDB. A small description, from the NAME section, after the dash. A help text, from the DESCRIPTION section. The author’s name, from the AUTHOR section. The copyright of the script, from the LICENSE section. Creation date - any text, from the DATE section. “<Toolbox>/Xtns/Perl/Script Name”If you specify “<Image>”, then the script is expecting to operate on, or create, an image. In this case Gimp::Fu will add as the first two parameters to the script the image and the drawable active when the script was invoked. If, however, the “image types” is left as blank or not specified, the plugin is expected to create and therefore return an image (and it will normally be placed under the File/Create menu). If you specify “<Toolbox>”, then the script is a standalone script that appears in the menu hierarchy under Filters (this is a historical thing) and takes all its inputs through the Gimp::Fu interface dialog. (left empty or no such section) Does not take image as input, does return an image. Gimp::Fu will automatically add that return value. 3.141 A floating point number. PF_SPINNER An integer value through a slider and a spinner interface. The range parameter should be specified and is interpreted as minimum, maximum, and step, e.g. [0,100,1]. PF_FONT “Arial” A font name. #ff7f00 A color may either be expressed as a reference to an array of three components, or as a hexadecimal triple, proceeded by the hash sign. The name of the parameter - a string. A help text for the parameter. Default value for the parameter. This should be given in the form listed in the table above. An array defining allowed range for the value. This is only used for PF_SLIDER and PF_SPINNER. Optionally, the return types of the function can be provided, from a RETURN VALUES section. This is specified in the same way as the Parameters above. There is no default or extra argument required. You will also note that “plug_in_” has been omitted from the method call above, and that not all its parameters appear to be getting passed! This is thanks to the object-oriented implementation in Gimp-Perl, which when given a method name, searches various prefixes for the underlying function including the plug-in related ones (including script_fu_). The code will normally display a new image if it creates one, and also return the new image, in accordance with the return types declared in parameter 10 of the podregister call described above. This enables Gimp::Fu scripts to be used noninteractively by other scripts. More about that behaviour below. You will have noticed above that the parameters to the function given to podregister used parameters either named in the POD, or supplied by Gimp::Fu, such as $drawable. This is because podregister automatically makes available to your function all the variables declared either in the POD documentation (the “PARAMETERS” section) or added depending on your “image types”. The following Gimp::Fu script example shows the steps described in the previous section. It registers a script that takes two values, the size of the image and a color, and then produces an image of the requested size with the requested color. Quite useless, but it shows the important steps of how to register a script, how to create a new image, and how to access some PDB functions. Most of these commands are directly copied out the PDB. 9 Creating a new image. 11 Creating one or more layers. 12 Attaching the layer to the image. 13-14 Do some painting operations in the layers. Then start GIMP. It is generally a good idea to test the syntax of the script with perl -c before starting GIMP. Note: Due to the way GIMP works, it is not possible to add scripts once GIMP is running. On the other hand, it is possible to change a script which has already been registered, as long as the parameters don’t change. The substitution rule for converting a PDB into a method is as simple as erasing gimp_image_ (or sometimes gimp_) from the beginning of the function call and calling this method through the image object. Similarly for the gimp_drawable_... functions. See the Gimp-Perl docs for more detail. Note that the object-oriented syntax appears to be only syntactic sugar that makes the calling syntax cleaner. The error messages are still given in the procedural format. What is going on is that GIMP, and the library on which it is implemented (Glib), use C in an object-oriented fashion. This procedure fills the specified drawable with the fill mode. If the fill mode is foreground, the current foreground color is used. If the fill mode is background, the current background color is used. Other fill modes should not be used. This procedure only affects regions within a selection if there is a selection active. If you want to fill the whole drawable, regardless of the selection, use ‘gimp-drawable-fill’. 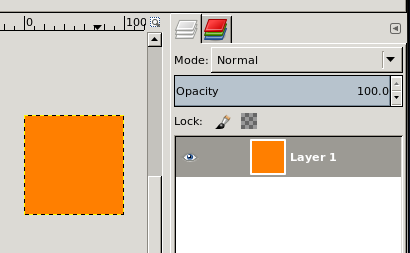 Thus, if a selection is active when gimp_edit_fill is called, only the selected region of the drawable is painted. Note also that you must substitute “_” for “-” in the names. This tool creates a rectangular selection over the specified image. The rectangular region can be either added to, subtracted from, or replace the contents of the previous selection mask. This procedure is affected by the following context setters: ‘gimp-context-set-feather’, ‘gimp-context-set-feather-radius’. The script is associated with an image since its menu path starts with “<Image>/…”. Note that as a result of this the callback sub in line 6 receives two additional parameters, the active image and the selected drawable. The use of the PDB functions gimp_image_undo_group_start and gimp_image_undo_group_end. These functions declare an undo group. When an undo is done on the image, instead of having the individual operators undo, all the actions between the undo start and the undo end calls will be undone at once. Besides rectangular selections elliptical selections may also be created through the PDB functions gimp_image_select_ellipse and gimp_image_select_polygon which allows the selection of ellipses and polygons. More complex selections may be created through the channel mechanism. The PDB gimp_channel_new() (Gimp::Channel->new) creates a new channel. The channel is a drawable that may be painted into, just like any other drawable, but with the difference that it is always a grey level image. Once the channel is finished, the channel may be loaded into the selection through the PDB function gimp_image_select_item. Search for “select” in the DB Browser to see a list of all the selection related functions. In perl it is trivial to write loops that together with the various selection tools gives powerful creative possibilities. Here is an example that mixes colors in circles. There is nothing really new here, but it shows the power of what we have described above. Here is an example of a script that creates an image containing “Hello world”. One thing to note in this script is that the text that is created on line 15 is a floating layer, that needs to be anchored to its parent layer. This is done in line 16 through the call to gimp_floating_sel_anchor(). Creation of text layer which exactly fits the text with the command gimp_text_fontname. Resizing the image and the background to the size of the text layer. The result is an image composed of two layers; a transparent text layer on top of a uniform background. # Create the text layer. Using -1 as the drawable creates a new layer. # background layer to this size. # Fill the background layer now when it has the right size. 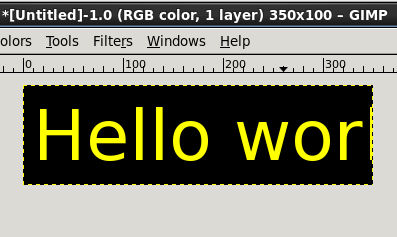 Note the special syntax of gimp_image_text_fontname in line 14 in basic-logo with the drawable = -1. The special case drawable=-1 means that instead of creating a floating layer, a new image layer will be created. When a region has been selected through one of the selection routines, the area outlined by the selection may be copied to the cut-buffer through the gimp_edit_copy command. The cut-buffer may subsequently be pasted into a different layer through the gimp_edit_paste command. When a layer is pasted it becomes a floating selection. This floating selection may be moved to its required position by the command gimp_layer_set_offsets, and finally it is pasted by the gimp_floating_sel_anchor command. Another way of determining the position of a pasted layer is to create a selection in the target image before the cut-buffer is pasted. This is illustrated in the following program, which works on one image and takes as a parameter another image, which it concatenates to the right of the first image. The lines 28-38 shows how the second image is copied and glued into the first image. So far the scripts have all been started from the menu structure within GIMP. But using Gimp::Fu there is another possibility, and that is to run the scripts from the command line, as a normal Perl program. When run this way the script tries to connect to the Perl-Server, and if it fails it will launch a GIMP of its own. If you plan to run several scripts this way, it is obviously much faster to run the Perl-Server since launching GIMP takes quite a bit of time. The Perl-Server may be started from the Filters/Perl menu. When a Gimp::Fu script is run from the command line, the result is the same as when it is run through the menus, except that it may be run with the --output parameter. This will save the result to a file instead of displaying it within GIMP. This is great for batch creation of logos, etc. Here are two invocations of the scripts declared above, but with output written to a jpg file and a png file. 2: basic-logo --font 'utopia 100' -o /tmp/bl.ppm --size 20 --text "Perl rules"
Another important use of this interface is that it enables running the Perl debugger on the perl scripts. When using the Perl-Server it is not necessary to use Gimp::Fu and the podregister function. Instead you may call Gimp::on_net, which takes as a parameter a reference to a sub routine that is called when your script has connected to a GIMP (or started one up). #  An interactive command line shell to GIMP. 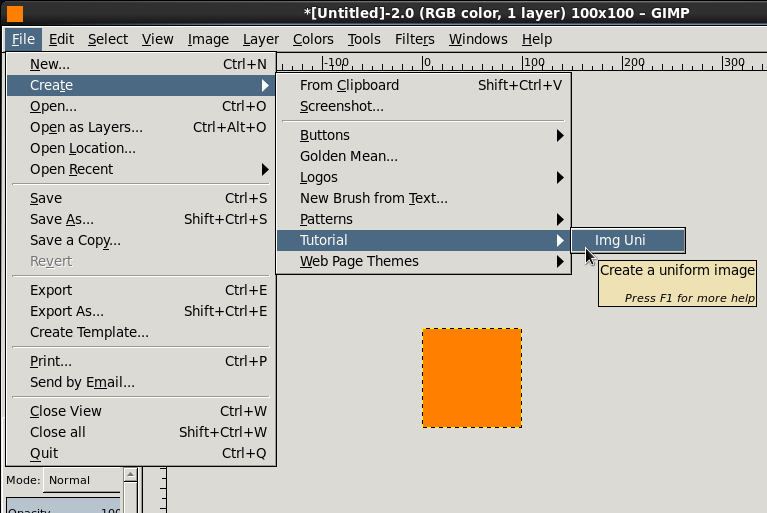 The possibility of writing customized Gtk interfaces (see examples/example-no-fu in the Gimp-Perl distribution). 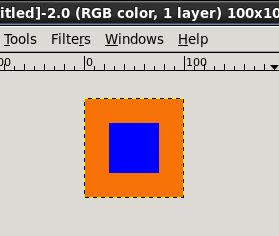 Writing fully-fledged plug-ins that manipulate the tile data through the Perl Data Language (PDL) module (see examples/map_to_gradient in the Gimp-Perl distribution). Using Gimp-Perl in a CGI environment. 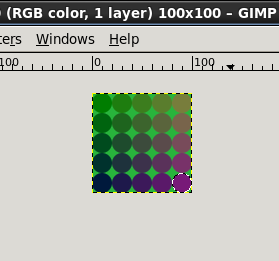 How to fill with gradients in a plugin (see examples/randomblends in the Gimp-Perl distribution). How to do polygon selections (see examples/triangle in the Gimp-Perl distribution). The Gimp-Perl distribution also has over 50 more example scripts supplied. Take a look through those for further inspiration! Please send your comments to dov.grobgeld@gmail.com. GIMP Tutorial - A Tutorial for GIMP-Perl Users (text & images) by Ed J is licensed under a Creative Commons Attribution-ShareAlike 3.0 Unported License.